Eric Johnson: Green certifications need to be treated as business decisions. Invited to Bucharest on the occasion of the Green Building Professionals training platform organized by the Romanian Green Building Council, Eric Johnson gave us an exclusive interview where he discussed the development of green building trends, the challenges of managing such a building and the role of the public authorities in the development of this field. What do you think are the causes for the slower adoption of green building techniques in certain Eastern European countries? Like in every new field, people are trying to find their way. I believe that they are relatively skeptical, for now, as they have a false impression on the amount of additional costs and they believe that hard work is necessary in order to make this idea profitable on the long term. I think that presently more and more concentrated efforts are being put into finding the right path for this new field. You are one of the founders of the Czech Republic GBC. How well is the concept of green buildings understood in your country and what are the next steps for a complete development of the field? I can tell you that all the owners of standard buildings are interested in obtaining a green certification for these constructions, regardless of its type. There are not many such buildings certified, but I believe that gradually their number will start to expand. At the beginning of the financial crisis, everybody wanted to be „green”, to prove that their products where good because they where green, and now I realize this is becoming more and more a strict criteria for the client. I know major developers that said that when you want to sell a building, you will not sell it for much unless it has a green certification. In four years, the Czech Green Building Council has had an impressive activity. We started with 13 certified buildings and we now have almost 100 or more. So even during the crisis we managed to attract enough members. What does the management of a green building require in addition to a conventional building? I think that the short answer is that one needs to establish clear objectives and make sure that everyone knows and respects them on a long term, doing what they are meant to do. It is important to know that the work is never the same, every day one learns something new. Do you think that more human resources are needed for the administration of such a building? I don’t think more people are needed, but more efficiency. Surely at least one person is required to overlook the whole process. And I don’t believe experience is necessarily required, but the enthusiasm for what you are doing. What is the most difficult and what is the easiest aspect to promote as a project manager for a green building? I think that no one would ever say that they don’t want to rent a space in a green building. The additional costs are usually the ones that scare the clients. I believe that when you have a building that is self-sustained in terms of energy and water, these costs will easily be recovered. The most difficult is to convince people not to smoke inside the building or do other simple things that they are usually reluctant to. Do you believe that the governmental factor has a decisive role in the development of such a trend in Europe? What additional regulations would be necessary at an European level for the encouragement of the green building trend? I am the advocate of a free market. I am not necessarily delighted by the regulations imposed by the state. For example, the American Government adopted the LEED standard for most of their public buildings and I believe that this is indeed a lead that other states should follow. I feel that these initiatives get stronger if the people engage in them voluntarily. However, I believe that the Governments should keep working on taxes and eventually adopt green certification standards for their buildings in order to encourage private institutions to follow. Are there currently any public buildings in Europe certified as green buildings? Yes. I think there are a few in Italy. There are definitely in the U.K., as they underwent a special development in this direction. Besides these two countries, I couldn’t name other examples in Europe. How do you appreciate the development of green buildings for the next 20 years in Europe, compared to USA, for example? Will there be any differences, or does the trend follow a standardization of the field world-wide? I believe there are a few differences. Europe relies more on Governments, while the U.S. puts more accent on the markets. So there will be differences in this sense, but generally we will have the same objectives. Even though apparently we are going in different directions, we will finally reach the same place. This field will develop more and more, people will begin to cooperate, to have better and better ideas and where there is a network of good ideas… for example if someone in Romania has a good idea, maybe someone in the U.S. will put it into good practice. It will all amount to sharing the information we have. What is your strongest argument when convincing a client to build green? I don’t think there is one sole argument because clients are different and they have different reasons to build green. Generally I try to convince my customers that it is a good business decision. It is the best thing to do in order to consume less energy, to build a solid reputation and to have a quality project. Eric Johnson is a specialist in the planning, cost management and delivery of the green development and promotion projects, LEED AP and BREEAM Assessor. On the 8th of August, Romania Green Building Council organized the Managing Green Building Project workshop, in Bucharest, a comprehensive insight into the key principles of sustainable construction. We were privileged to have Eric Johnson among us, a consultant specialized in planning, cost management, and delivery of green commercial development projects. Eric demonstrated the importance of management quality, sharing from his vast experience gained as a LEEP AP and BREEAM Assessor and involvement in numerous international committees of experts. Among the objective, the course tried to give a full definition of an integrated project management, identify the requirements and challenges posed, as well as the assessment tools and strategies needed to successfully deliver high performance building projects, aiming to increasing profitability through streamlined management and planning practices. The 30 participants enjoyed an interactive training, the informative sessions were interspersed with case studies and teamwork, which helped them successfully achieve the objectives. Also, they identified the most appropriate ways of implementing best business practices for the management of sustainable buildings. We believe that raising public awareness about the use of assessment tools and adopting an integrated project management, will help the future development in this area. 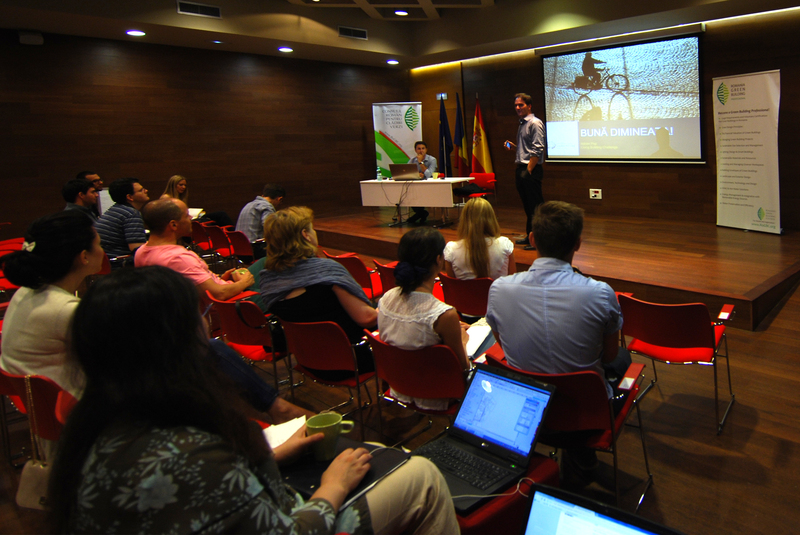 Event location at the Cervantes Institute was provided by our partners AECOM, which was the perfect setting for out courses and we would like to use this opportunity and Thank them! Romania Green Building Council, in partnership with DAS Engineering Group and Cluj-Napoca Town hall, invited the IT&C companies from Cluj to a conference on the subject of financial incentives for highly energy efficient green buildings. The conference was opened by the representative of Cluj Napoca local authorities, Ms. Emilia Botezean, who welcomed the guests with and introductory speech. Following this, Steven Borncamp, president of Romania Green Building Council, granted the Cluj Napoca local authorities with the Award for the Governmental Initiative of the Year 2012, earned through by implementing the tax reduction on buildings in order to reward energy efficiency and green performance. Cluj-Napoca is the first city in Romania to adopt this policy, opening the path for other local public authorities that we hope will follow this success example. 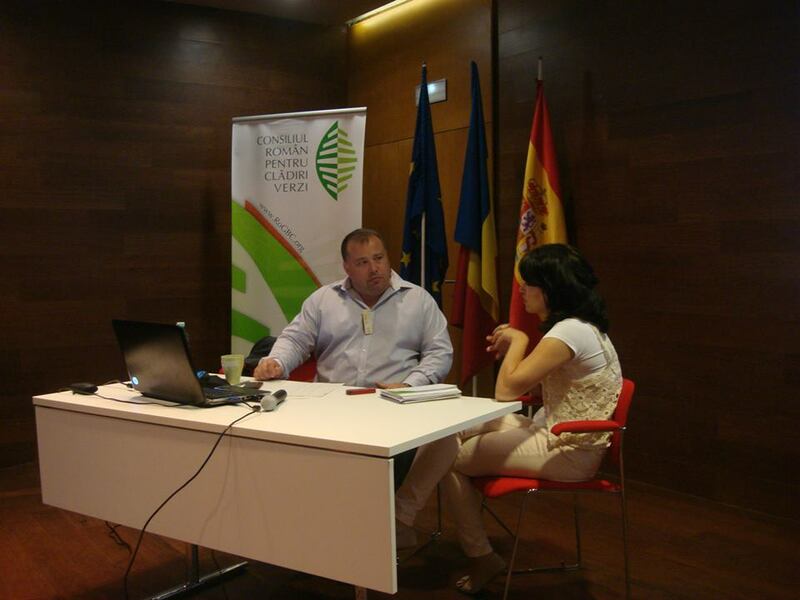 After the award, Mr. Borncamp presented a brief overview of the green building trend and industry capability in Romania. Thus, Romania’s accession to the European Union and resultant legislative changes has increased the strategic outlook on high quality, sustainable construction. Local companies are improving their capability while leading international companies have entered the Romanian market bringing an increased level of professionalism, and implicitly, the requests on the market. From a green building perspective, there is a significant increase in awareness of the Romanian business community on the issue of sustainability and energy efficiency. Adding to the above the opportunity to grow in the underdeveloped field of green building in Romania, we can say that the market is highly favourable to sustainable project initiatives. Further on, Mr. Dorin Beu, lecturer at the Technical University of Cluj Napoca, presented the financial incentives for green buildings, followed by Alexandra Stoica’ s presentation, representing DAS Engineering, regarding the steps required to achieve a sufficient level of green building performance to qualify for the tax discount. On the initiative of the Center for Technological Transfer CENTI Cluj Napoca, a new step was taken in the direction of the development of Romanian-Hungarian business relations in the field of green energy, in order to secure a sustainable and clean future. During the 2nd and 3rd of July 2013 an event dedicated to the Use of Green Energy Sources for a Sustainable and Clean Future in Romania and Hungary took place in Târgu Mureș, consisting of a conference that hosted specialists from both countries, business meetings between companies based both in Romania and Hungary and a study visit to the companies active in the field of sustainable energy in Covasna County. The event was dedicated primarily to companies working in the green energy sector, yet it can be considered a model of good practice in international cooperation for other regions and industries as well. During the two day conference, a significant moment was the signing of the Collaboration Protocol regarding the establishing of the first Regional Cluster for Sustainable Urban Development „Green Building& Development”. It will act as an organisation that enables the cooperation between the economic field, local public authorities and research institutes, looking to align and to represent the economic and general interests of urban communities. The cluster will work as a legal entity in the form of a non-governmental organisation, with the operational procedures, the association’s relations and competences to be discussed and established through the mutual agreement of the members. The cluster’s general objectives are to participate and initiate innovative and growing projects, to support the sustainable urban development through legislative initiatives, the training of specialists in the field and the creation of new workplaces, as well as greening the urban transportation, attracting funds for rehabilitation projects and participating in consortium to project auctions regarding urban development. Internally, the cluster seeks to increase the profit of member companies, to develop its own products and services, together with a coherent cluster policy, a personal IT system, to contribute to the professional development of its members and employees and to attract funds for management. Romania Green Building Council was among the signatories, along other 29 institutions coming from various fields, such as universities, financial institutions, constructions, sustainable energy, IT, transportation, as well as consultancy companies, project management companies, local public authorities and catalyst institutions. As a professional organisation, according to the agreement, RoGBC takes on the role to support the professional formation of the cluster’s members and its growth at national end euro-regional level. Given the strong compatibility between the RoGBC objectives and those of the new Regional Cluster, we are pleased to be founding members of the most recent cooperation initiative in sustainable urban developments. The Association for Energy Efficiency and Environmental Protection, în collaboration with Bursa Construcțiilor/ Construction Stock, organised on Friday, the 21st of June2013, a conference on the subject of Energy Efficiency of the new estate development. Almost 100 specialists attended the event, debating the possible solutions for increasing the energy efficiency in the real estate projects, both residential and commercial, amid the new European legislation on highly energy efficient buildings, taking into consideration the available financing and models of good practice at home and abroad. In the context of the „times of the lowest price”, the architect Șerban Țigănaș, president of the Order of Architects in Romania,opened the discussion with the question of the relation between the individual, the building and the city, exemplifying this with urban renewal projects. The main estate developers came forward to present their plans for future growth and their interest to increase energy efficiency within these proposals. Representing the business sector, several speakers came to the microphone – Ingo Nissen, country manager at Sonae Sierra, the international commercial centres developer, speaking about energy efficient commercial spaces, the developers of the residential ensemble Metropolitan Residence, Robertino Georgescu and Daniel Drăgulin, and Mihai Bizu, the developer ofthe Appollo Residence ensemble. Further on, Mr. Ion Dogeanu, as Executive Director of The Association for Energy Efficiency and Environmental Protection, presented the European context for the improvement of the energy performance of the buildings, identifying development opportunities within the long term European Strategy. Șerban Danciu, Task Force Manager Romania at the Institute for Building Performance (BPIE) presented the priorities in the development of the strategy meant to improve the energy performance of the buildings in Romania, proposing several options for combining the available funds. Oana Stamatin, LEED Green Associate at Colliers International, spoke about the steps that need to be taken in order to reduce the energy waste in buildings and the result that can be achieved, considering the building orientation, the location, the building envelope, natural light and lighting system, the use of water, the heating and cooling and the use of efficient equipment. By applying ecological standards to the above, the building is prone get higher rent and selling prices. The architect Mihai Trandafir presented a model of good practice in de sector of energy efficient buildings, the project Eurogate in Viena, the largest residential ensemble Passive House certified, also detailing the requirements of this certification. Finally, the construction material producers, represented by Octavian Nicula, Manager Thermo Insulating Products at AdePlast and Marcel Ionescu, general Director at Europlastic, presented solutions for the thermo insulation of the buildings. The audience was invited to participate in the debate, formed of estate developers, constructors, architects, energetic auditors, engineers, real estate consultant, representatives of patronages and specialised associations, press, etc. Following the increased interest of the public authorities in Bucharest and throughout the country in the sustainable development of the built environment, on Monday, the 10th of June, Romania Green Building Council and the Association of Municipalities of Romania launched the Guide for local tax reduction on green buildings during the conference on financial incentives for the promotion of green constructions with a high energetic performance. The document represents a working instrument for the local public authorities, meant to support the decision making process in order to attract investments for the construction of green buildings and to reward the investors’ efforts through tax reduction on these buildings. The launch of the guide was accompanied by presentations that traced the context of the legislative proposal for tax reduction on green buildings. Mr. Steven Borncamp, president of the Romanian Green Building Council, launched the presentation series through a detailing of the benefits that the green buildings bring to both the Romanian community and to the development of the construction industry’s capacities. Mr. Borncamp depicted the necessity and the commitment required from the private investors to provide significant investments for the development of sustainable new buildings or renovation projects in exchange for the benefit of tax reduction. He also highlighted several success cases, including the Cluj-Napoca Municipality, the first town to apply the tax reduction on buildings in order to reward energy efficiency and green performance. In this respect, the vice- mayor of Bucharest, Mr. Marcel Nicolaescu, confirmed the orientation of the capital city towards an environmentally friendly urban development. Luiza Manolea presented the legislation that stands at the basis of the decision of tax reduction on green buildings, a chance with which she highlighted the characteristics and principles on which this kind of tax incentives are rewarded, ensuring a high adaptability to the specificities of each community and willing to establish a balance between the interest of the community and that of the building owners. In this way, the highest investment efforts and the achievement of the highest sustainability requirements are rewarded through tax reductions, for a longer period up to four years, while the tax reductions don’t exceed a cumulative of 80% of the tax due. Also, she mentioned that the proposed fiscal measure for the promotion of green building is different from other fiscal or financial incentives, as: it includes all types of buildings, not only the residential ones, the investment comes from the owner, the initiative is private, the energetic efficiency requirements are higher and are accompanied by sustainability criteria, whose achievement is confirmed by final certifications internationally recognised. Bringing a new perspective to the subject, this time the view of the energetic auditor, Mr. Eugen Goldhammer sent out a clear message- You can’t manage what you can’t measure. Thus, he highlighted the benefits of an energetic audit, both from the point of view of the authorities and that of the companies, given that it represents a major instrument within the implementation process and further on in the annual monitoring of the environmental management systems, according to ISO 14001 and EMAS, and that it has an important part in reaching the established objectives through the annual and multi- annual strategies of increasing the energetic efficiency and of reducing the emissions of carbon dioxide, and not the least, it reduces costs with maintenance of the buildings. Further on, Alinda Dudu’s presentation concentrated on the introduction of the main international certifications in sustainability. She discussed the fact that the international certification standards for green buildings, of which LEED and BREEAM are the best known, represent a viable method of evaluating the performance in sustainability of a building. These systems are voluntary, neutrals- managed by third parties and can be applied at different stages of the building’s life, as well as to a variety of architectonic programs in Romania. In addition to this, the subject of creating a package of tax incentives, neutrals from the point of view of the expenses, has been brought to discussion, in order to encourage the development of constructions, renovations and the management of environmentally friendly buildings, while bringing significant value to the local and regional economy. Mr. John Lyins discussed this subject, adding that from the point of view of the employees, they can only gain from the low rate of absenteeism and of illness, as well as from the increase of efficiency at the workplace. The interest shown by the public authorities and their openness towards the improvement of community life encourage and at the same time bind us to continue the initiative to build or transform existing buildings into sustainable constructions. We wish that through this practical Guide, also meant to be a model of decision making for the local counsel, we can contribute to the implementation of as many instruments for the stimulation of green building constructions. The guide for local tax reduction on green buildings, as well as the legislation pack that provided the basis to its realization can be accessed on the homepage of the Romania Green Building Council.